With hope of drying out overnight, we slept hard. That is, until the rain woke us up and we had to close up the tent. Luckily the rain was short-lived, but the rapid cool down afterwards meant plenty of condensation. We were going to remain soaked. Any chance of viewing the Sky Lakes below us was short-lived as the clouds moved back in. But it made for some beautiful hiking. A full day in the forest as we approached Mount McLoughlin, a very Fuji-esque ancient volcano that is always prominent in the southern Oregon sky. But we wouldn’t see much of it, thanks to the clouds and trees. By late afternoon we were on the lower flanks of the mountain and too close to see it. A few thousand feet lower than we were the morning before, the tent finally dried out overnight. But clouds meant that we still wouldn’t see Mount McLoughlin as we hiked south. Here’s a view of the mountain from Lake of the Woods, just a few miles east of the trail, taken in summer of ’14. The clouds remained, occasionally threatening rain, but only occasionally spitting. The cool weather helped motivate us to keep moving. That and a lunchtime visit with our trail angel Salt Lick. One nice thing about getting closer to home is that we get more frequent visits by friends. That’s handy, especially as we near the end and are constantly wet. Demoralizing conditions offset by friends. Soon we met up with Salt Lick, hiked to the next trailhead where he had lunch waiting for us, then more miles down the trail with him as we kept moving. Several miles down trail, we bid farewell to Salt Lick as he had to turn around to get back to his car. We had miles to go, only covering half of our day’s goal by mid-afternoon. The rain started coming down harder, motivating us to move faster. 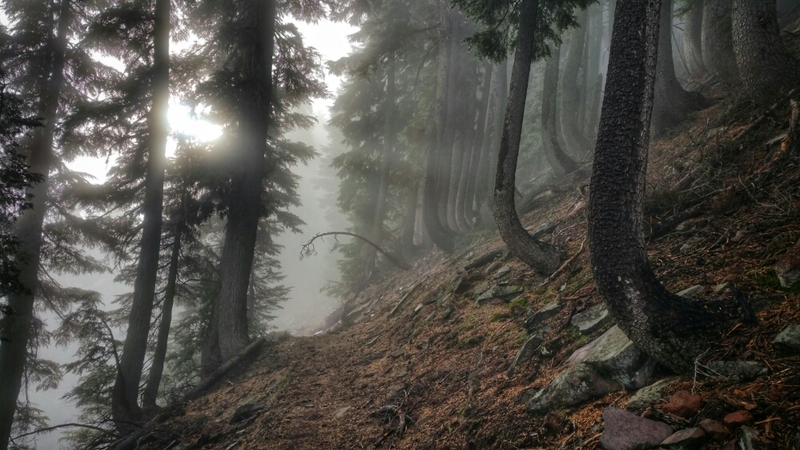 Mind you, the updates we had been receiving from hikers and hunters along the trail was that the rain was to stop the previous day. Good thing we didn’t believe them. By late afternoon we had pushed past 26 miles but still had miles to go to our goal. 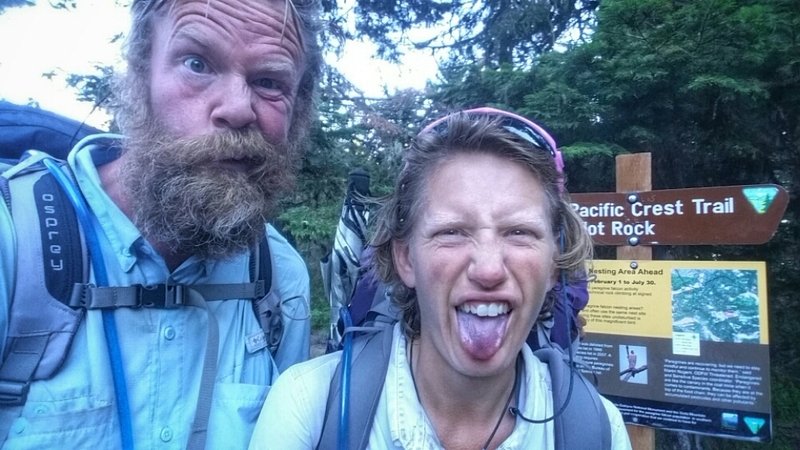 Soon after, Jen entered the late stages of experiencing an ultramarathon – “What in the [expletive deleted] do you mean we still have (X number of) miles to go?” and “Why in the [expletive deleted] are we doing this?”. Recognizing where she was, I kept the conversation light-hearted but on topic, explaining where she was mentally, then comparing it to our friend Lint, who, after finishing the Continental Divide Trail (CDT) to become only the third person to capture his third Triple Crown (thru-hiking the PCT, the Appalachian Trail and the CDT) ran his first 100-mile ultramarathon. I explained that she was where he was mentally at mile 80 and her response was – “Wait a minute. He ran 100 miles? Why in the [expletive deleted] would he want to do that?”. I told her she could ask him in a couple of days. Then she stepped on a wet rock and her feet went out from under her. Thanks to her trekking poles she didn’t fall straight on her pack. Instead, she almost recovered, then went over again, bit didn’t fall. Almost recovering, she almost went down again, then finally got her feet under her. The most epic save of the entire hike. 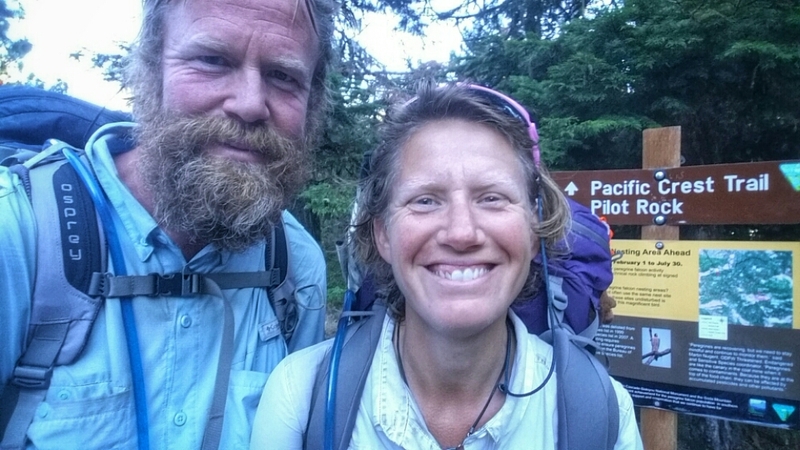 We both laughed for a long while, it broke her funk and she proceeded to drag me the rest of the way to camp in what was our longest mileage for the entire hike – 31.4 miles. She walked a legit ultra-marathon – 50.7km. Not just walked, but carried her pack, somewhere in the 30-35lb range. That’s a lot tougher than “just walking” 50+km. It was in camp that I had my meltdown. A paid campsite with an area set up for thru-hikers, there wasn’t a level spot to be had. Once we figured out the best spot, I started setting up the tent. The clay was quite interesting as it was extremely difficult to get a stake in the ground, but as soon as I would put tension on a line, a stake would pull right out. Sometimes the one attached to the line I was tensioning, sometimes one of the other stakes. Good thing no one was around to hear my tirade. I even told Jen that we were going to grab our sleeping bags and sleep on the floor of the bathroom. I didn’t care if we couldn’t turn off the lights. But she was patient and managed to find rocks for me to use to finishing pitching the tent, where we both slept all night, waiting for more rain. Rain that finally never arrived. With promise of sun and perhaps some drier feet, we were moving. We were back in what had basically been our backyard for the past couple of years. We were walking tread that we had both walked many times. We were both walking tread that we had both helped clear of fallen trees and rehabilitated. We were both walking tread that we had spent days walking with good friends. That led to stories and laughs. 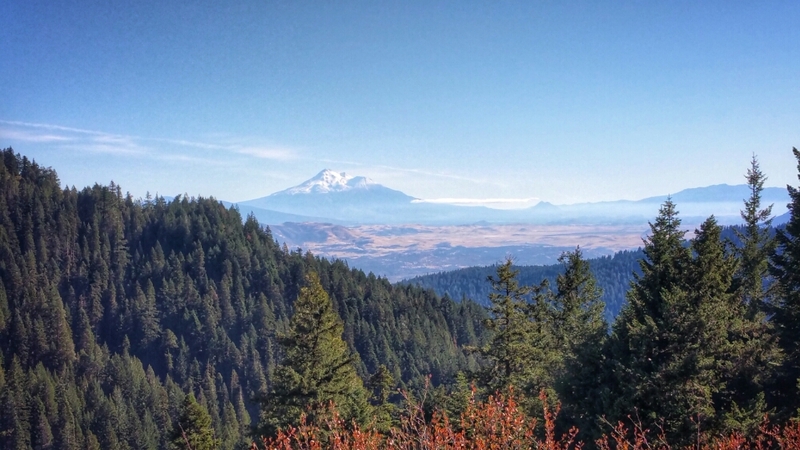 Then we saw the view we had been waiting for – a look into the Rogue Valley and the end of our journey. That was also a view of our day’s hike, along the distant ridgeline to the left to Pilot Rock, then to the base of Mount Ashland, the highest peak just right of center. Soon after we met a couple of classes of elementary school children who were out on the trail getting lessons on the geography and biosphere of everything we could see. We were a bit of an interruption because the kids wanted to know about our hike. We wanted to sit in the back of the class and listen to the lesson. 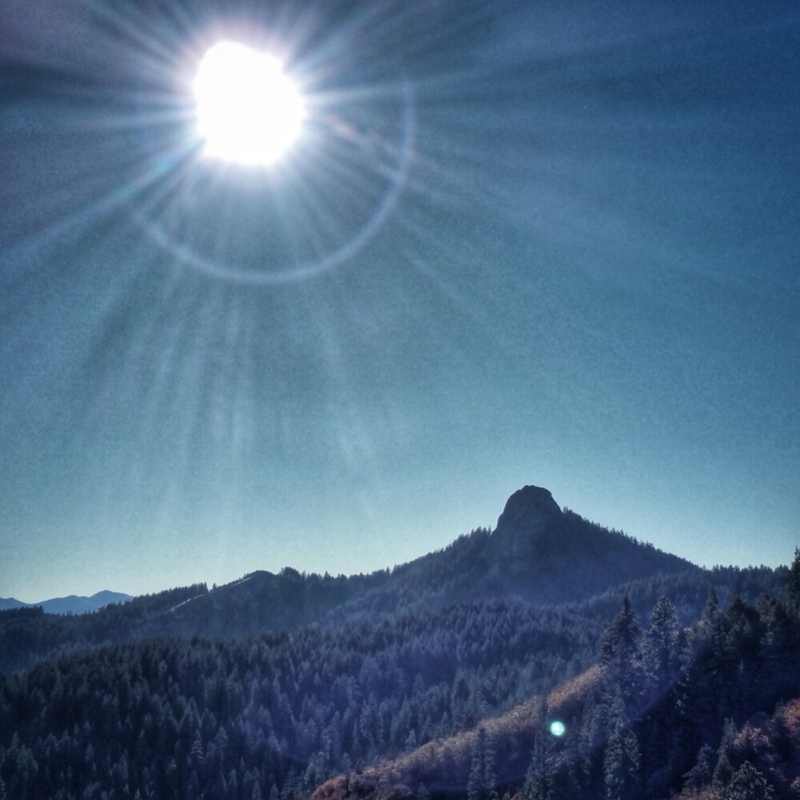 By mid-afternoon we were approaching Pilot Rock and got our first glimpse in many months of the Northern California valleys. Plus a view of Mount Shasta with a new blanket of snow. Then the trailhead. 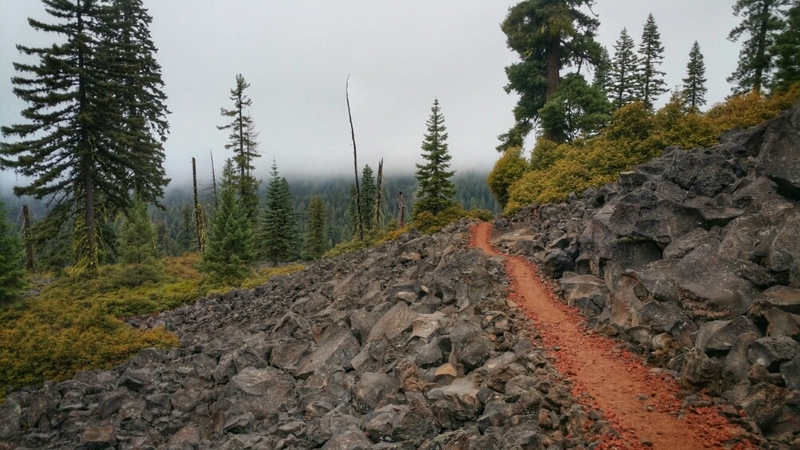 We had both worked on the PCT and Pilot Rock trail in this area. And the trails were a favorite of Skinny’s. We had good laughs talking about the boy. With several miles left to go and friends to meet, we beat feet. The sun was setting fast and it was dark by the time we got to the first trailhead. They had just pulled up, but we still had over half a mile to go, so they drove down to the other trailhead. On the way their headlights illuminated a black bear hanging out. It was gone by the time we got there. Once to the other trailhead, we arrived at the spot where we had come off the trail in August and skipped forward to complete Washington before winter hit. To completely tie the knot, we walked up the trail about 10 feet so there was complete overlap and no doubt in our mind that we had walked the entire trail. A kiss sealed the deal, we loaded up in the car and rode into town. Congratulations!!!!! My 13 yr old and I met you in mid June close to Mt Whitney. And here you are!!!!! Congrats!! We’ve enjoyed your post. What an incredible journey and accomplishment! Thanks Greg. We’ve wondered what your son thinks of the experience now that he has it under his belt and the “suffering” isn’t so fresh in his mind. He said he’ll be ready to do again in 13 years!!!! He was captivated by your post. Marveled at your accomplishment!! Yet hasn’t wanted to put a back on since we got home!! We are all living vicariously through the both of you!!! Congrats again!! What a summer you’ve lived! Congrats on a remarkable feat. Any plans for presentations? No plans for presentations. We’ve got a lot of things on our plate for the coming year and couldn’t see making that happen. There are plenty of folks out there doing them, though. Wow wow wow! Prosit, salut, slainte, cheers! All four back at you. Thank you for your support the whole way. We will toast soon. Congrats on finishing. It was a privilege to tag along.